fundamental presents a new album: f.
f. is the second installment of our musical discussion following Development (Armored Records 2012). We chose to self-release this album. there is a series of events that takes place before the new concept is fully integrated into one’s life. This holds true whether the concept be musical, mathematical, personal, or spiritual. While each new concept presents specific intricacies each follows a similar broad path: Awakening, Contemplation, and finally Enlightenment. The musician follows the path of awakening, contemplation, and enlightenment through learning songs, licks, scales, modes, technique, ear-training, and specific idiomatic traits of styles. The musician’s path is echoed throughout the arts by painters, actors, and dancers. This path is the essence of tension and release. The path is the V-I cadence and blues. To solve a mathematical equation is to follow this same path. Personal life follows the path internally and through interaction with others. The music on f. is based on the path of spiritual enlightenment through awakening, contemplation, and enlightenment. A prevalent shape throughout f. is the hour glass. I was first exposed to rhythmic shapes in music while studying South Indian classical music with mridangam master Poovular Sriji in college. A downward pyramid is created by a rhythmic grouping of four, followed by a grouping of three, followed by a grouping of two (Figure 1). 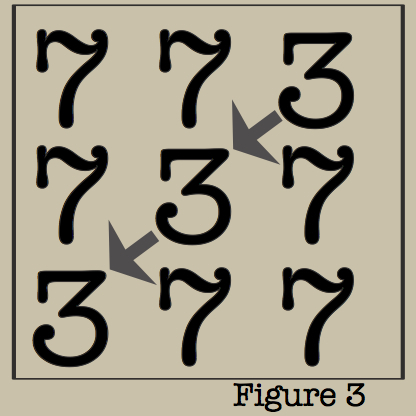 To create an hourglass one simply mirrors this diminution with a grouping of two, followed by a grouping of three, followed by a grouping of four. 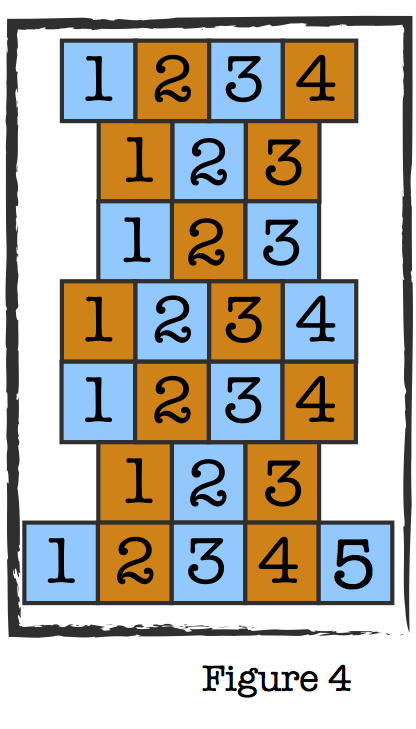 This mirrored pyramid creates the hourglass shape 4-3-2-2-3-4 (Figure 2). 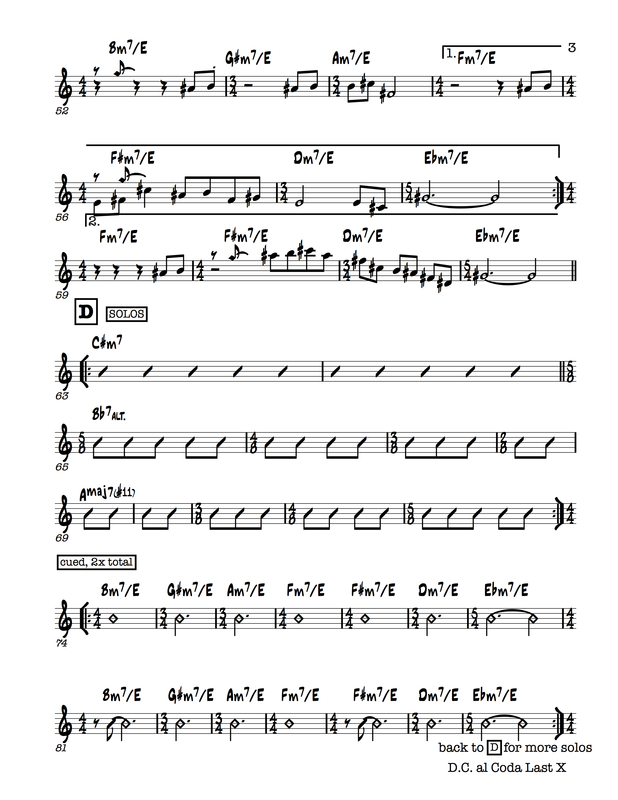 This is the rhythmic grouping used on the first section of my song Kerouac from Development to create a division of eighteen eighth-notes notated as a 9/4 meter. This concept is also copied in the second section of Kerouac with a smaller 7/4 hourglass created by 4-3-3-4. The hourglass shape and other rhythmic shapes appear throughout f.
7412 exemplifies the path. The three themes are arranged AABCCBA creating a broad reference to an hour glass shape. The first theme, or A, is a joyous realization of a new idea, the second theme, or B, is a deep contemplation on that idea and the third theme, or C, is a struggle with the idea. 7412 is a miniature version of f. in its entirity: realization, contemplation, struggle, more contemplation, and finally, enlightenment. 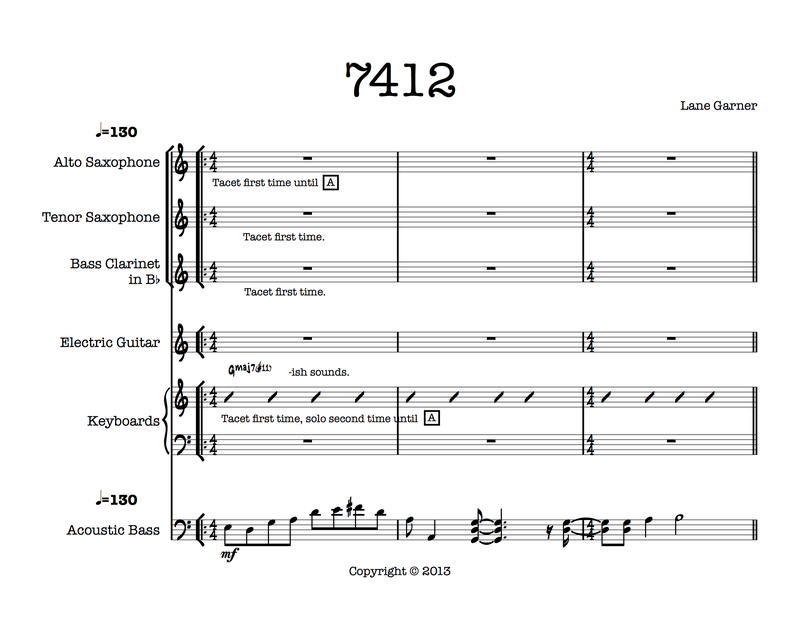 I began writing this song on July 4, 2012 while sitting in my friend’s apartment in Los Angeles listening to fireworks- thus the title 7412. 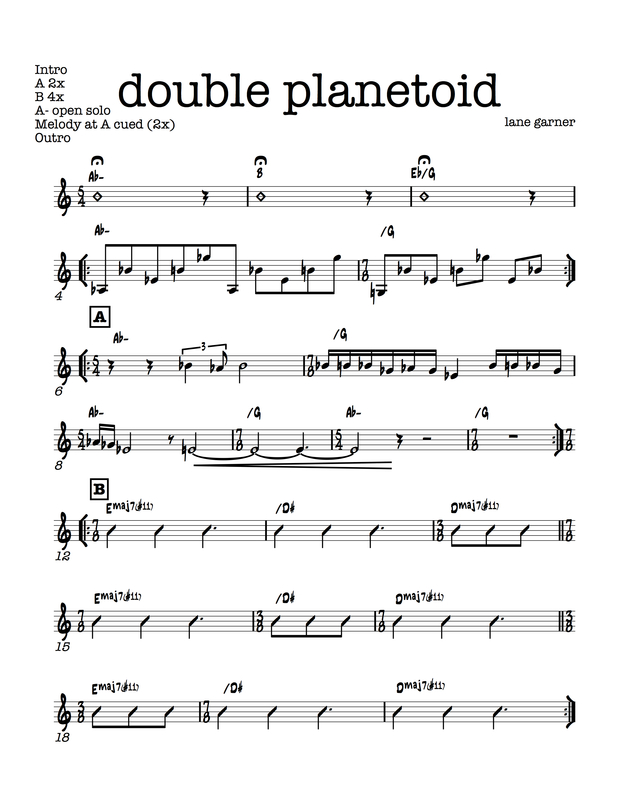 Double Planetoid was originally composed in 2011 immediately prior to recording Development. Planetoid was tracked for the album but we were over the CD time limit and had to cut something. 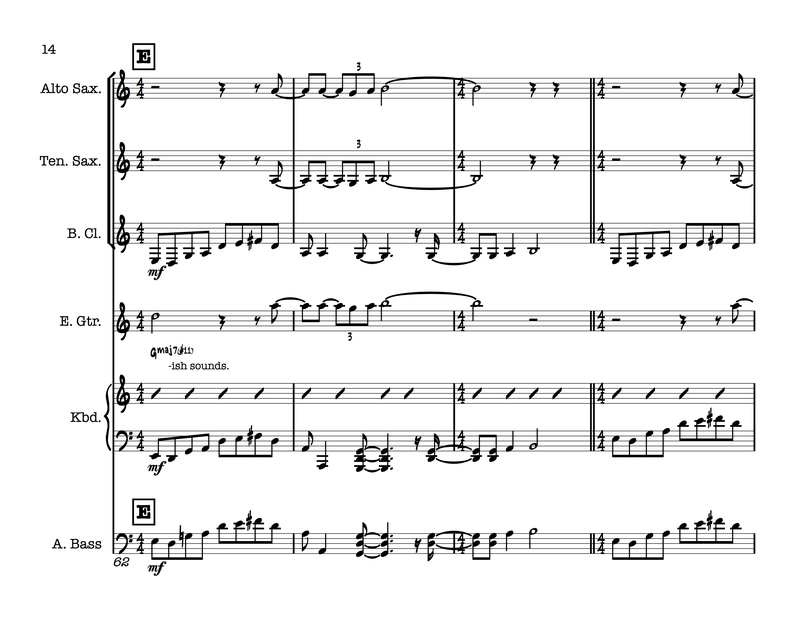 The rubato intro is meant to express longing, discontent, and confusion. 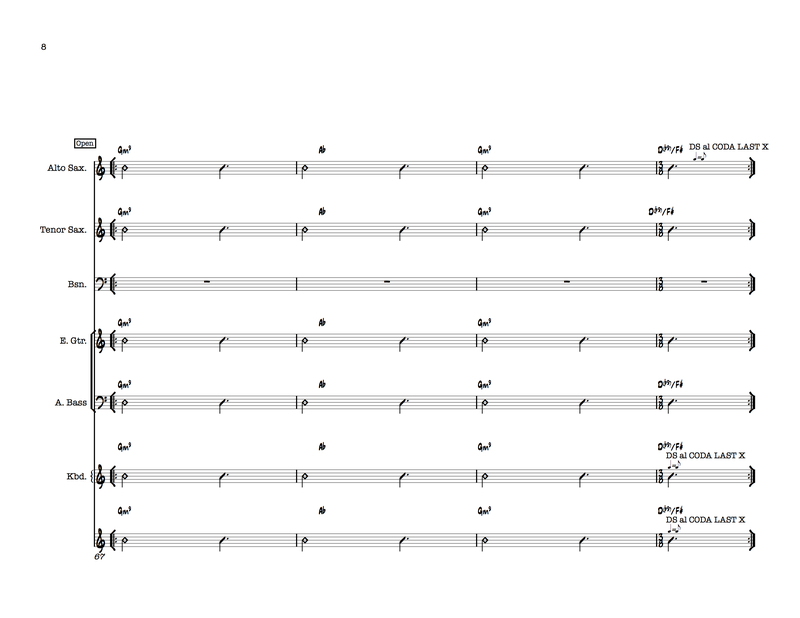 The rhythm section plays fermatas on the harmonies of Abmin7, B, and Eb/G. 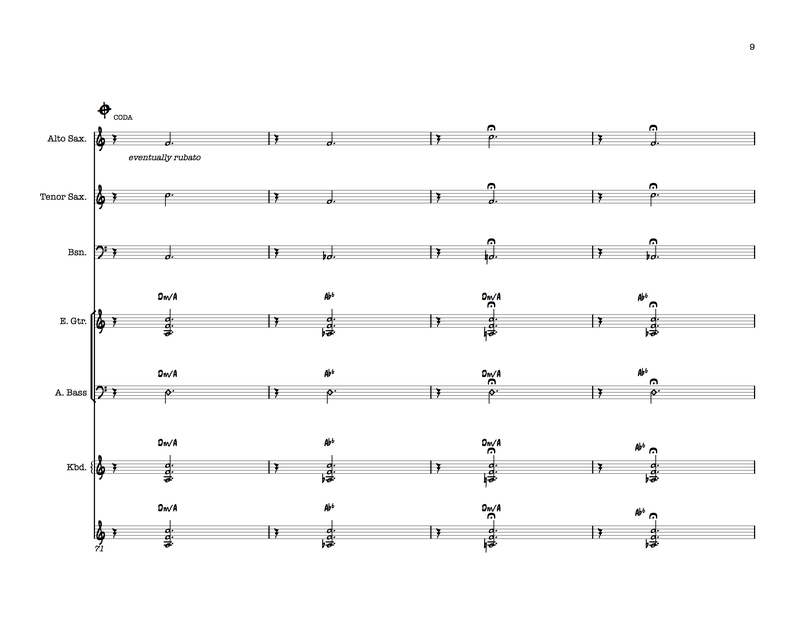 The guitar and bass clarinet then set up the contemplation of the melody with the angular line based on a Scott Henderson guitar warm-up exercise. 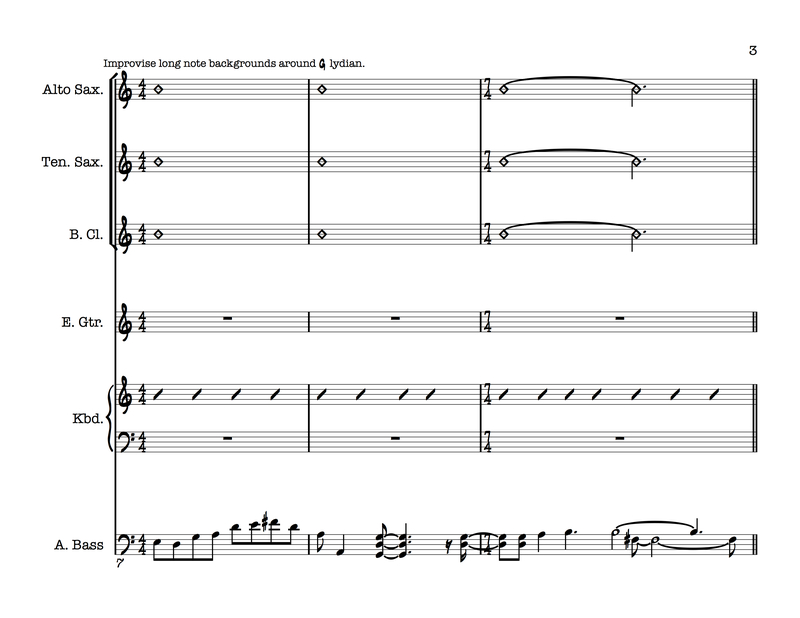 The meter is set in 17/4 with two measures of 5/4 and one measure of 7/4. B begins the first and only solo with Devin Eddleman on alto saxophone. Here we take an alternate view on the meter of 17/4. 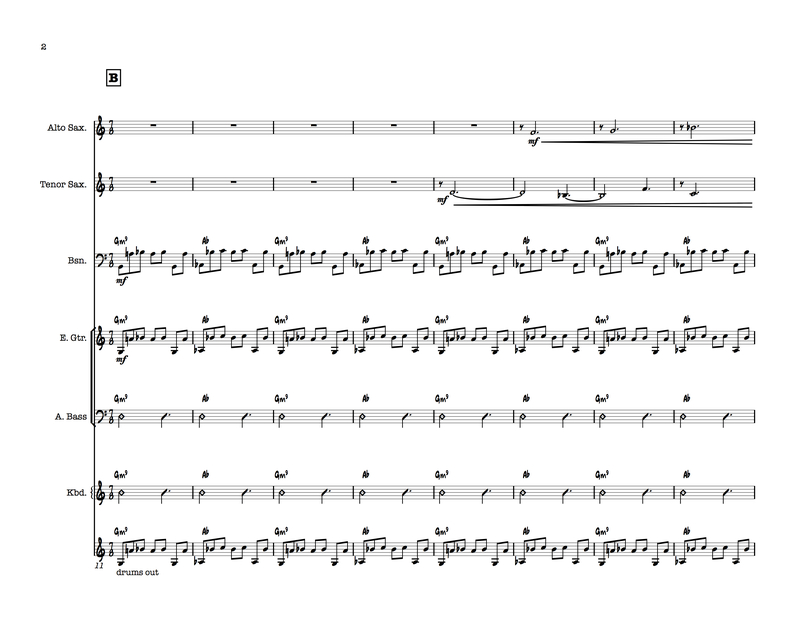 It is comprised of groups of three measures- each with it’s own harmony: Emaj7#11, Emaj7#11/D#, and Dmaj7#11. 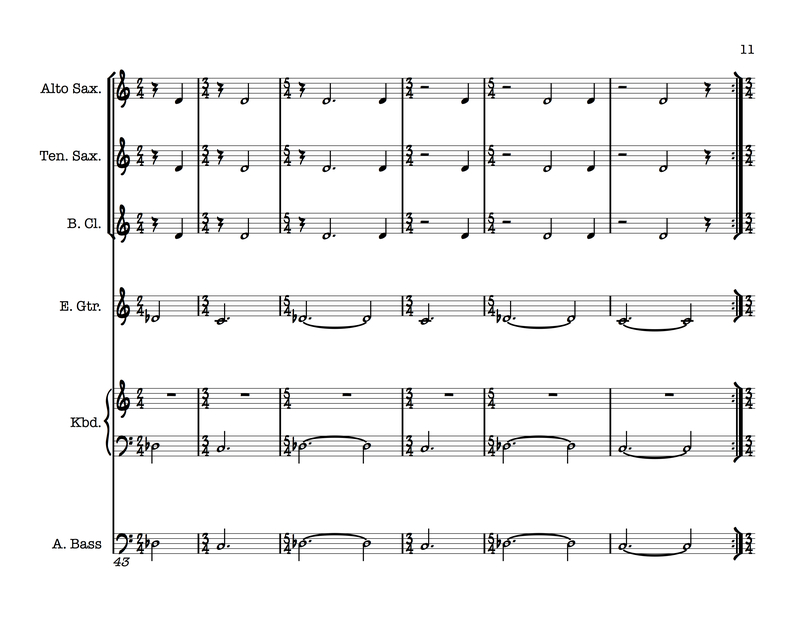 The first phrase is two measures of 7/4 and one measure of 3/4. 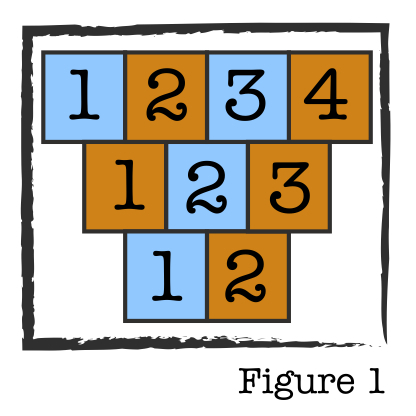 The 3/4 measure then moves across the matrix in a diagonal line (Figure 3). 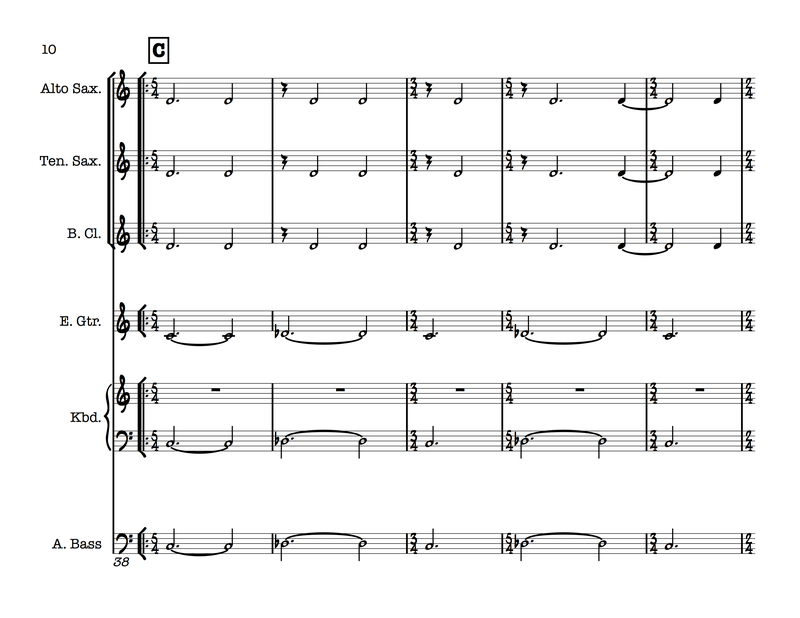 The second phrase is one measure of 7/4, one measure of 3/4, and one measure of 7/4. The third phrase is a measure of 3/4 and two measures of 7/4. 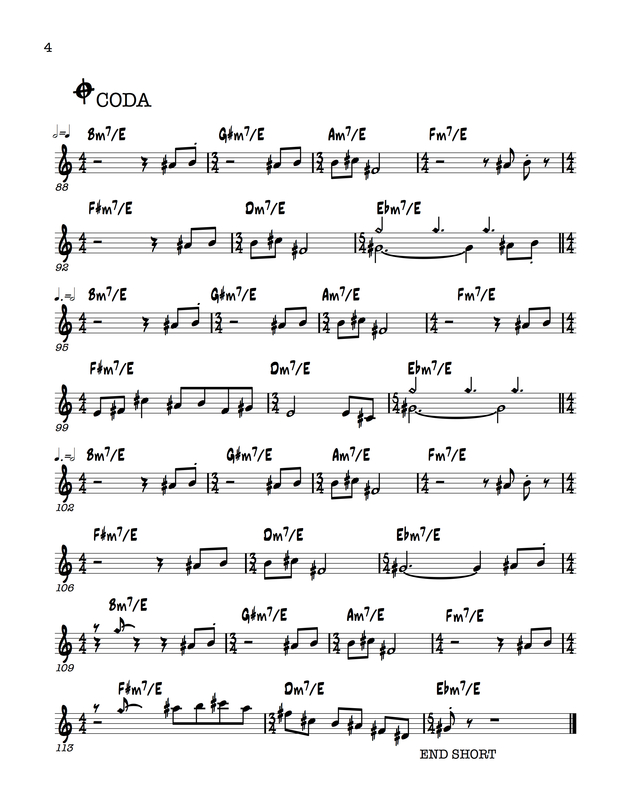 The solo form is four times through B followed by A open until the melody is cued. 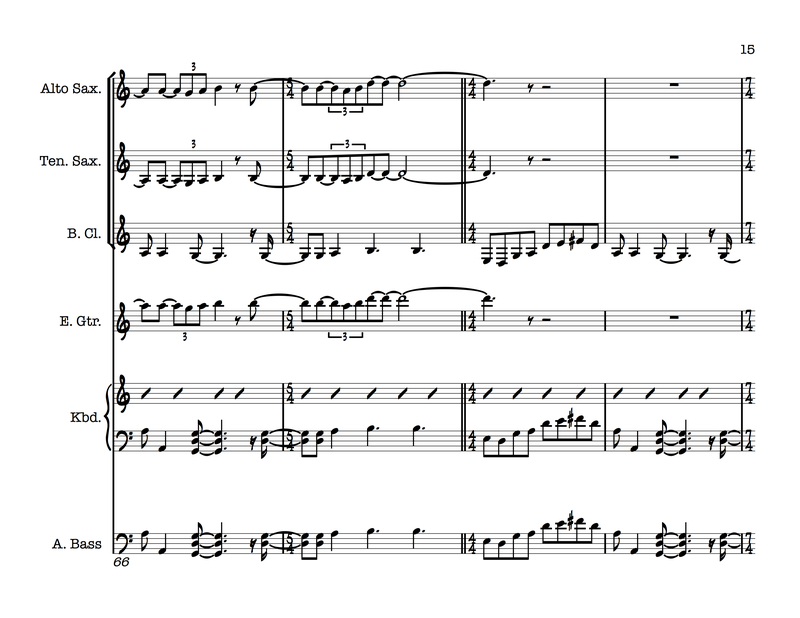 The piece ends with one time through the rubato chords to suggest a decrease in longing, discontent, and confusion. The title is taken from an M.C. Escher wood engraving in which a man made world and a natural world coexist but are completely unaware of each other. The alternate takes on the 17/4 meter between the two main sections illustrate Escher’s concept. Thrive moves on from the strain and agony of Double Planetoid to find joy in the first theme which is contrasted with a frantic contemplation in the second theme. The first theme (intro through B) begins with a descending pentatonic scale (B-G#-F#-E-C#) over C#minor7 harmony in 5/4 for four bars. 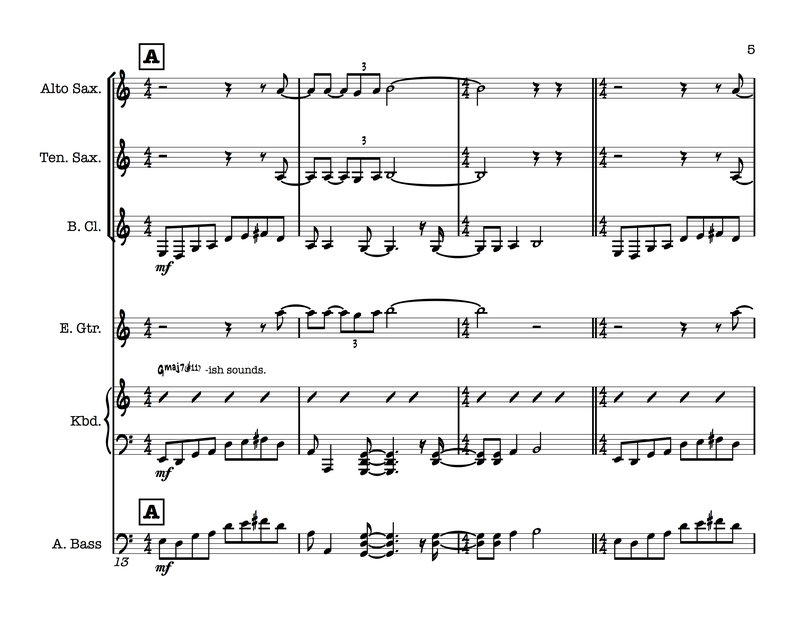 The second phrase of the first theme uses an extended version of the hourglass shape from Kerouac and 7412 of 5-4-3-2-2-3-4-5. The harmony of the second phrase is split in half between Bb7alt and Amaj7#11. The pentatonic theme continues with the same scale descending from a step lower (G#-F#-E-C#-B). 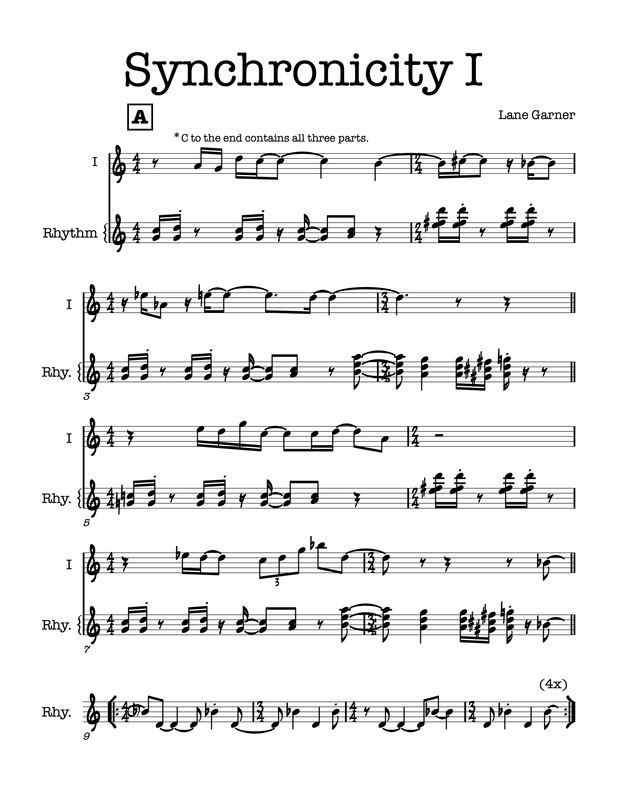 These five notes then shrink and grow with the rhythmic hourglass shape. 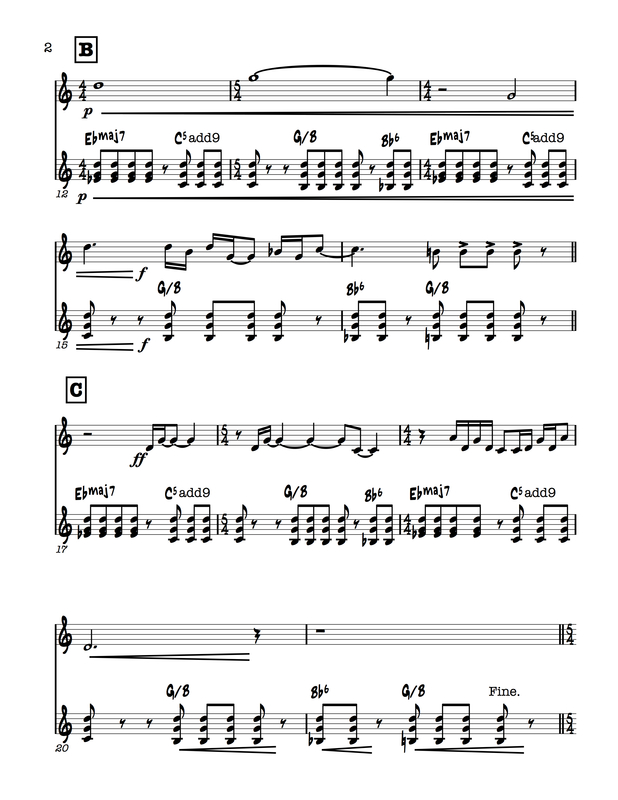 This melodic fragment is echoed in the saxophones and eventually dovetails as a rhythm section figure under the saxophone melody. 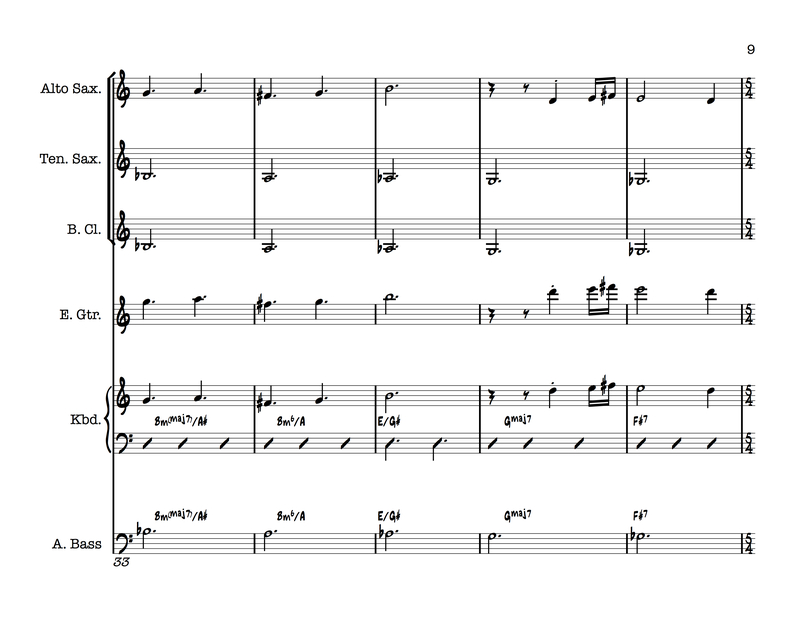 The melody occurs twice and is answered by a variation and the saxophones playing the hourglass shape acapella. 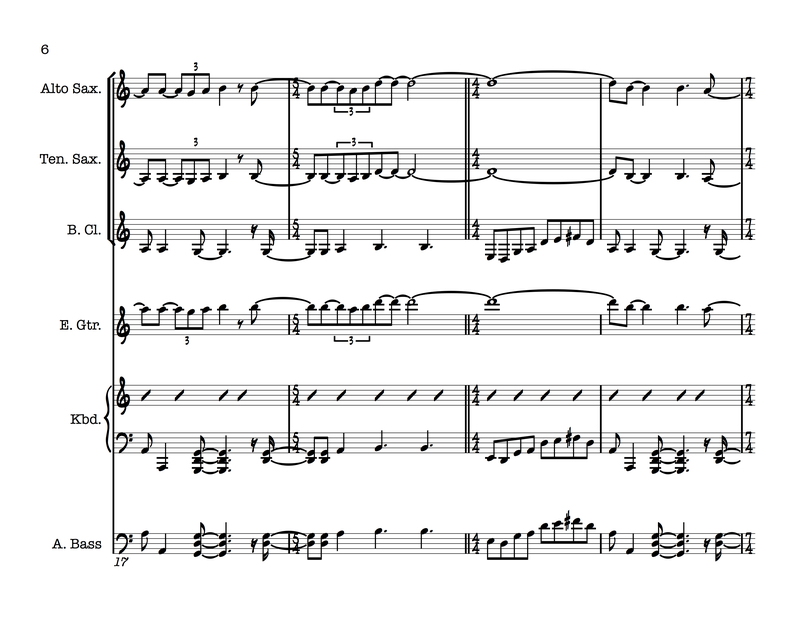 This variation on the melody begins the contemplation of the bridge and the acapella signifies a self-awareness which is quickly interrupted by the frantic contemplation of the second theme. 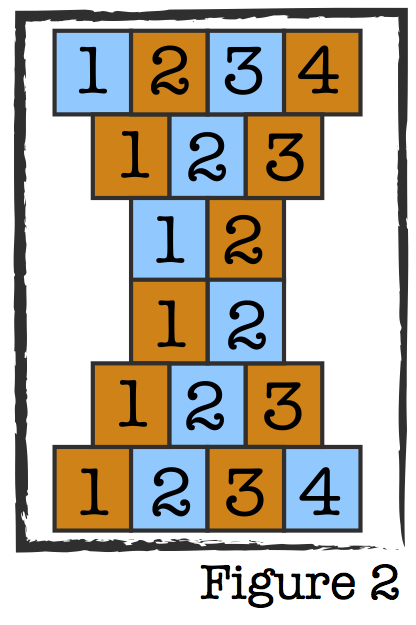 The second theme of Thrive (B and C) creates the rhythmic shape of an hourglass with a downward facing pyramid and a base through the meters 4/4, 3/4, 3/4, 4/4, 4/4, 3/4, and 5/4 (Figure 4) with the first and fifth bars being offset by one eighth note the second time. The harmony over the pedal E is a parallel minor-seven chord moving in the intervals of: down a minor third, up a halfstep, down a major third, up a half step, down a major third, up a half step. 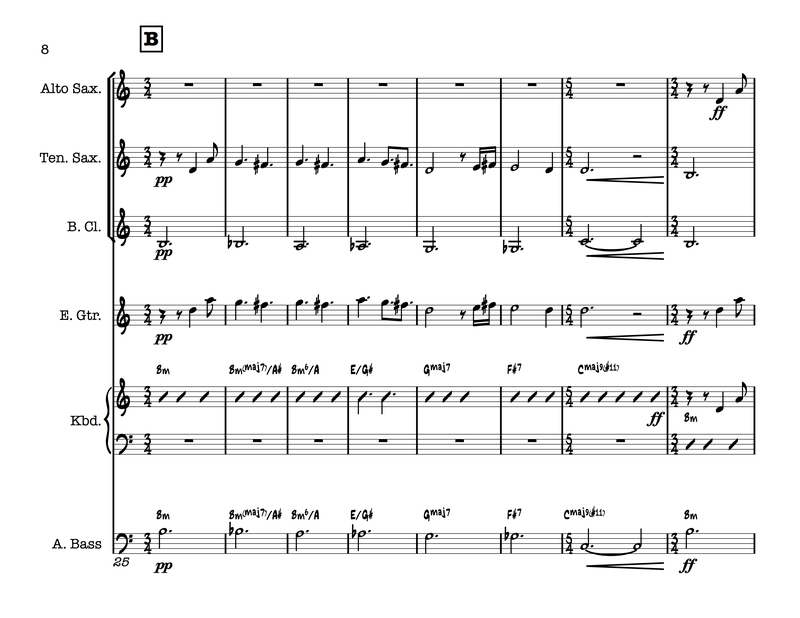 After one statement of this theme by the rhythm section, the saxophones play a jagged melody to add to the sense of frantic contemplation. 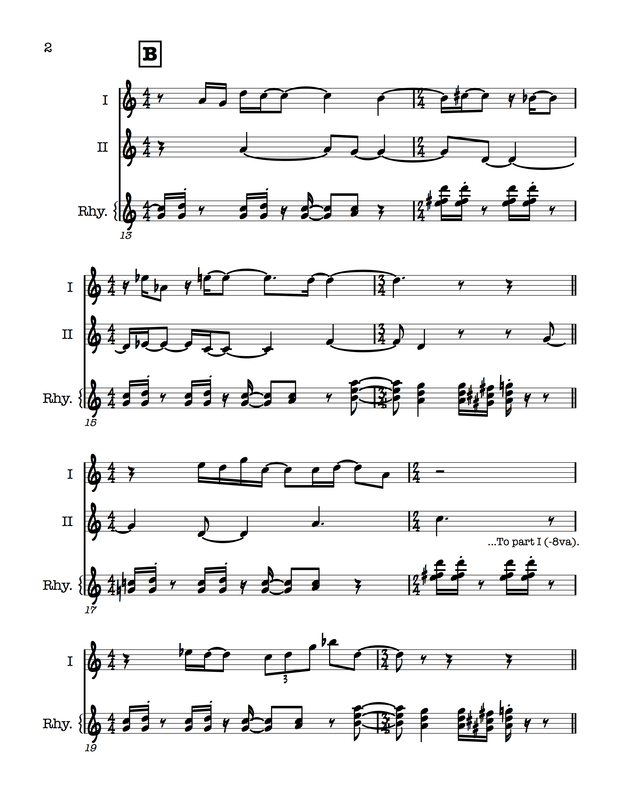 This contemplation leads to a realization of joy again with the arrival of the first theme for the solos. 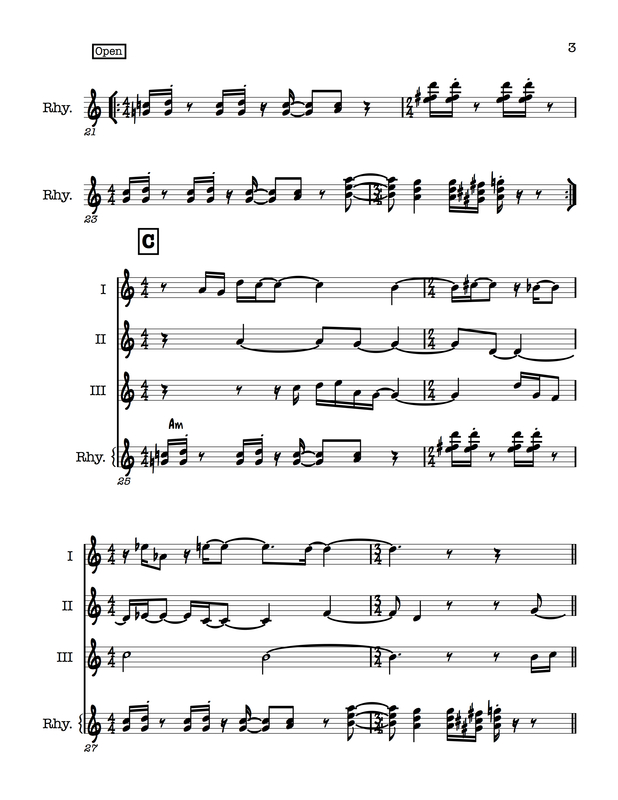 Each solo is capped with two times through the second section to show each soloist’s frantic contemplation before moving on to the joy of the first theme for the next soloist or head out. 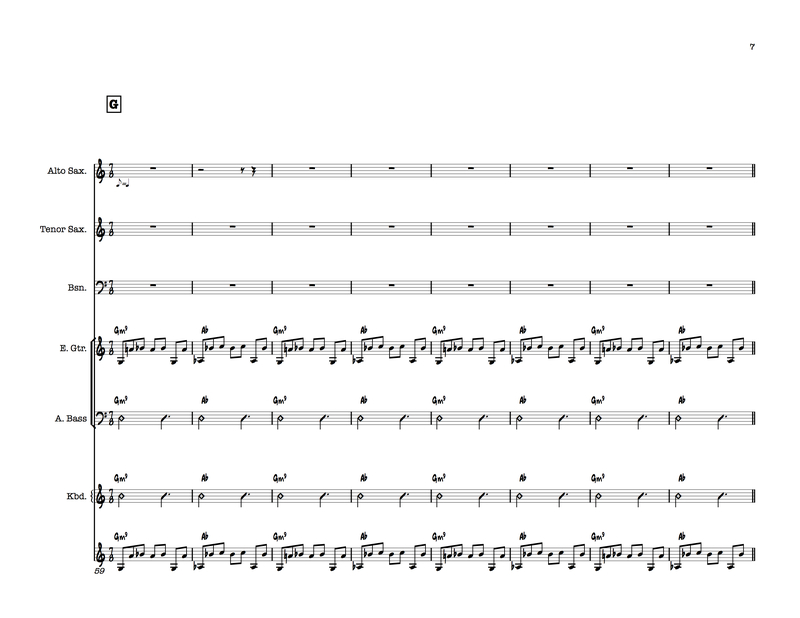 The final statement of the second section begins at the normal tempo with just the rhythm section and then goes through a series of rhythmic transformations suggested by drummer Matt Young. These rhythmic transformations depict a cleared mind contemplating enlightenment which is sped up each time to show the mind taking over and the contemplation becoming more and more frantic leading into the next piece The Fall of Man by Devin Eddleman. 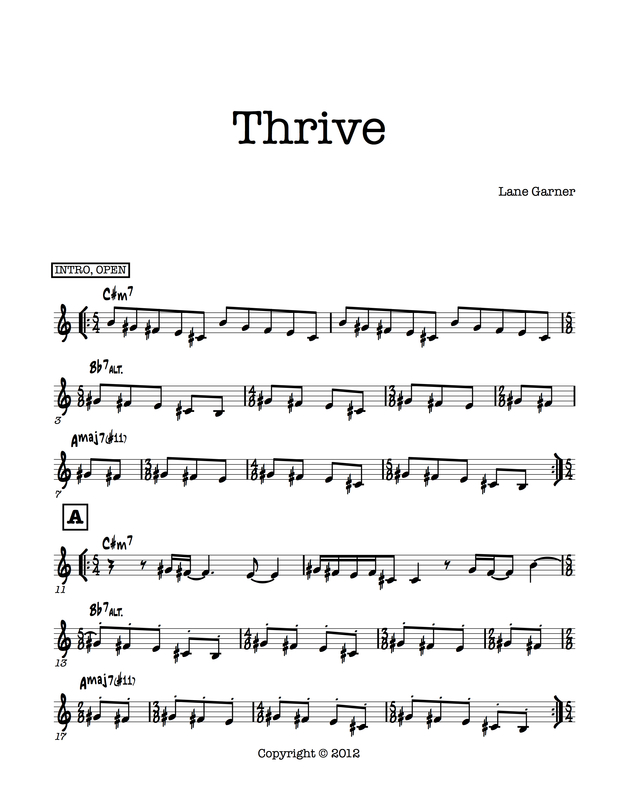 Thrive features solos by Lane Garner on guitar and Addison Frei on keyboard. 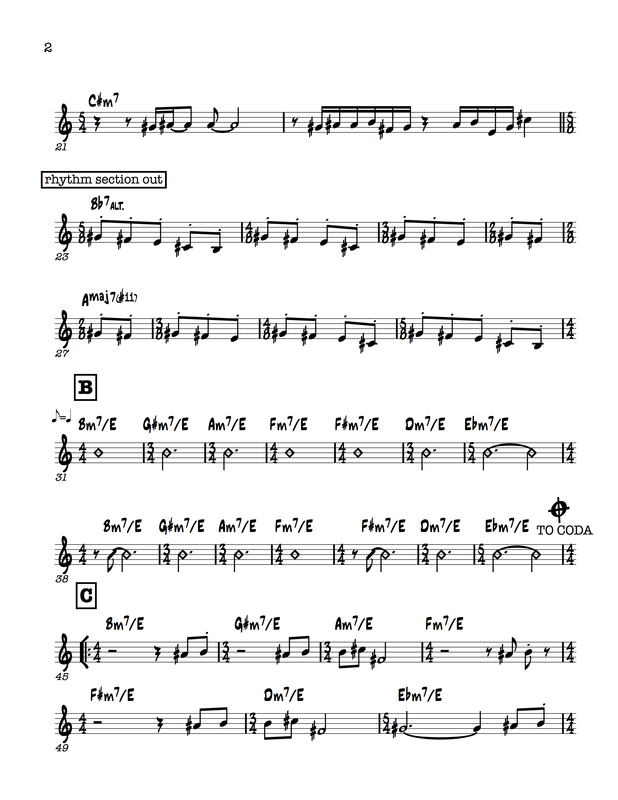 *G is held for a half note on beat three rather than going back to F for the final measure. 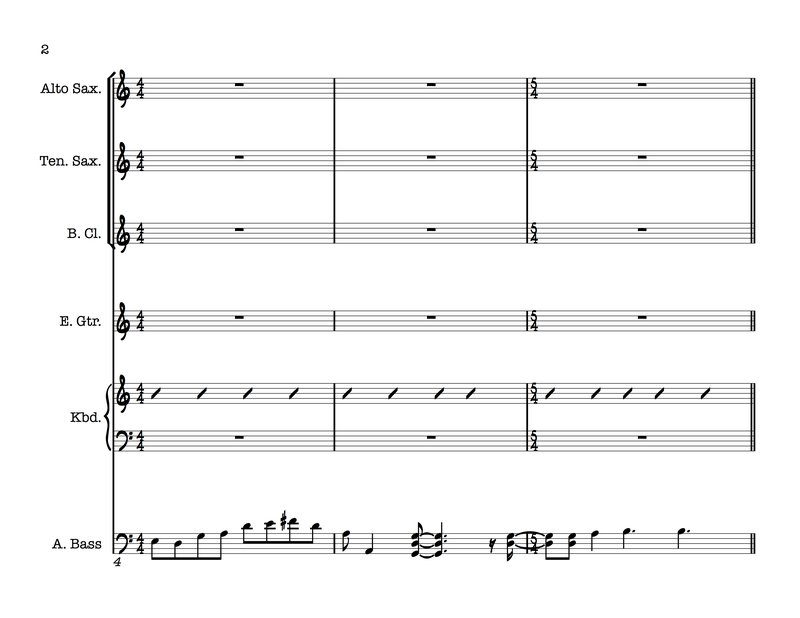 The harmonic movement of this first theme is also meant to create an interesting melodic bass line. The bass line and melodic sequence dictate the harmony. This is the first instance of synchronicity. A primarily pentatonic melody enters at A on top of the melodic sequence/bass line dictated harmony to create further synchronicity. 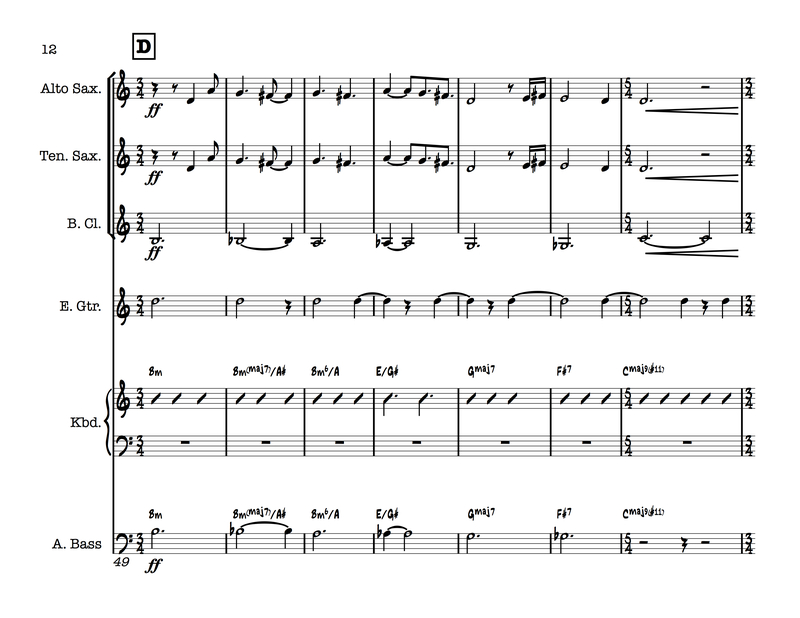 The synchronicity deepens at measure 26 when the melody splits into three parts played by soprano, alto, and tenor saxophones. At B an entirely new texture appears to suggest a new idea to contemplate. The tempo arbitrarily speeds up. Both textures are positive while remaining unique unlike earlier pieces such as 7412 and Thrive which go into a dark contemplation for the middle section. This is to suggest approaching new ideas from a positive outlook and having a fresh outlook on past ideas. B begins with keyboard, played by Addison Frei, taking the melody. 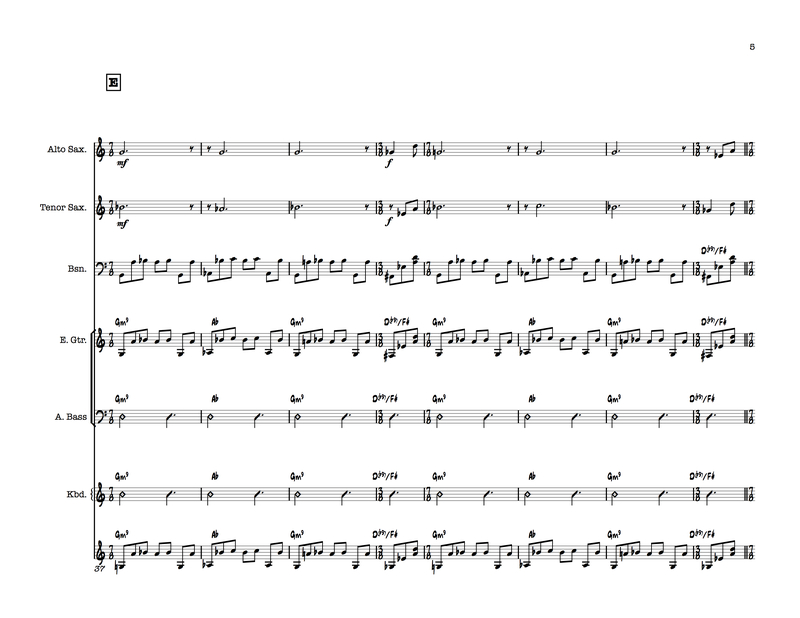 After six measures the saxophones take over while being split. While all the parts exist together they are still sepearate yet coexistant with the first theme. 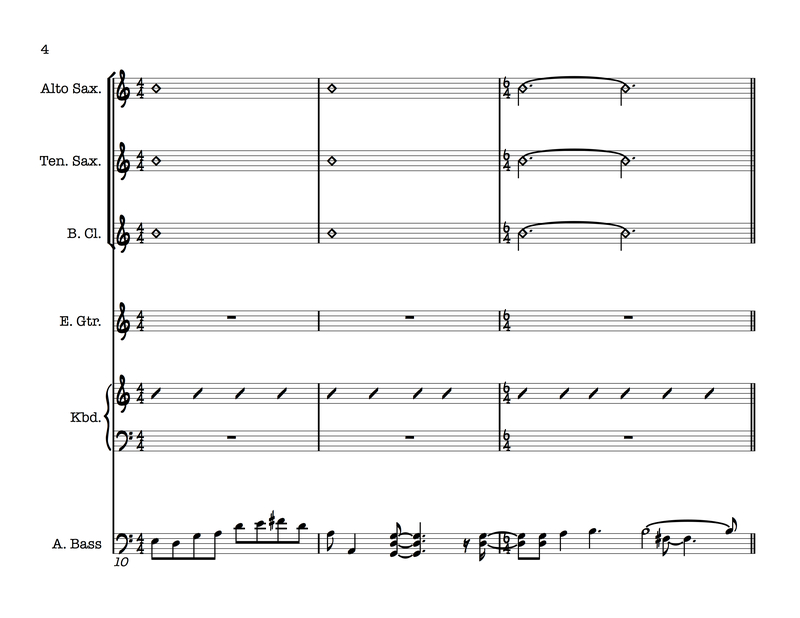 The new sounds of B exist together within themselves, yet still synchronize with the very different first theme. Solos are over the form with the melody at B always occurring as is. 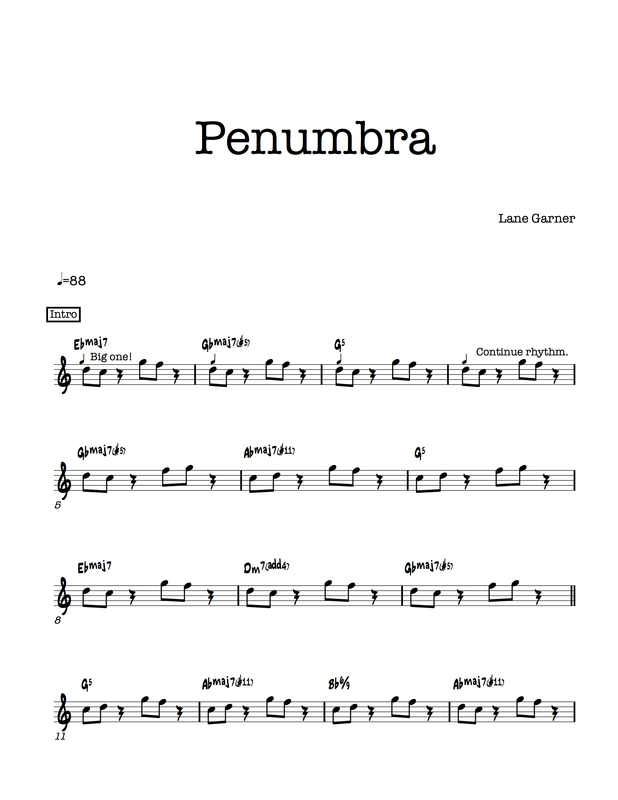 Penumbra features solos by Spenser Liszt on soprano saxophone and Lane Garner on guitar. Synchronicity I contains three different unrelated motifs that coexist with one another. 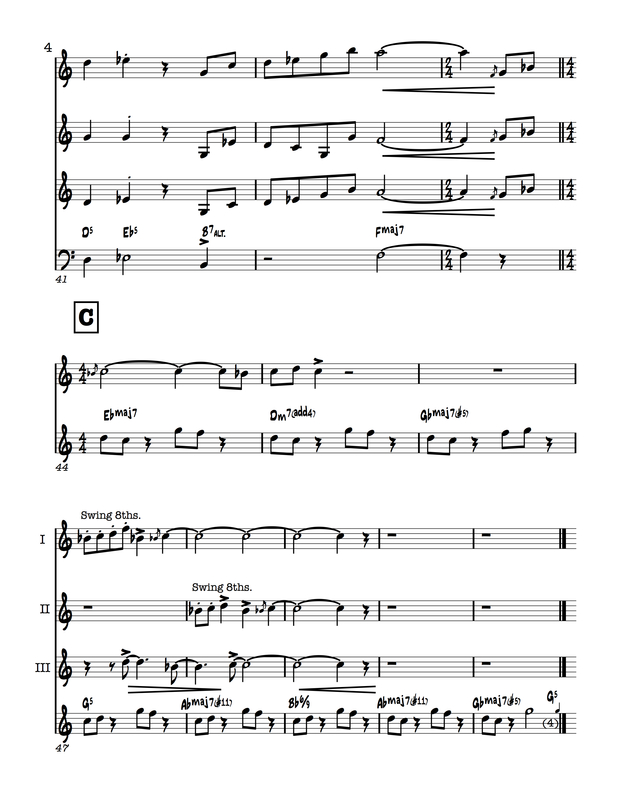 A new melodic motif is introduced at A, B, and C. Another underlying motif is in the rhythm section groove and hits. 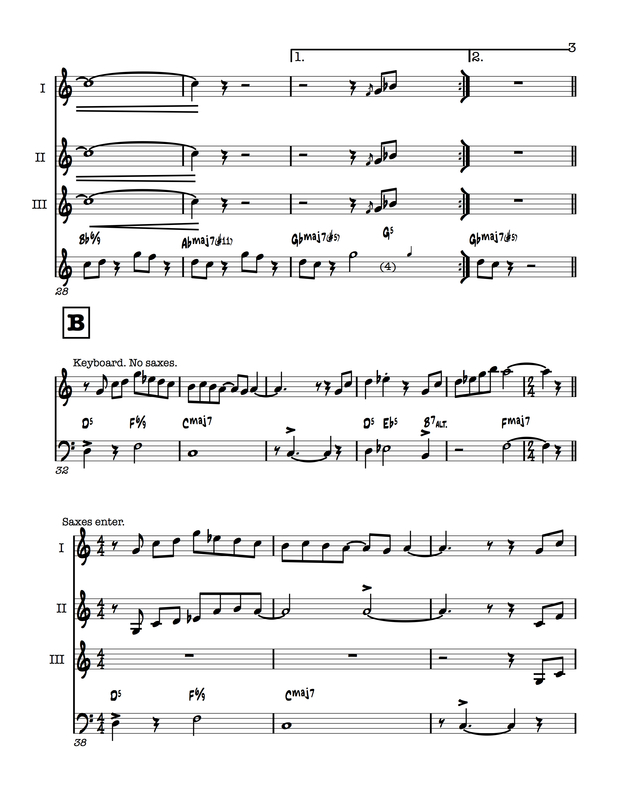 At A the first voice is introduced in the soprano saxophone. 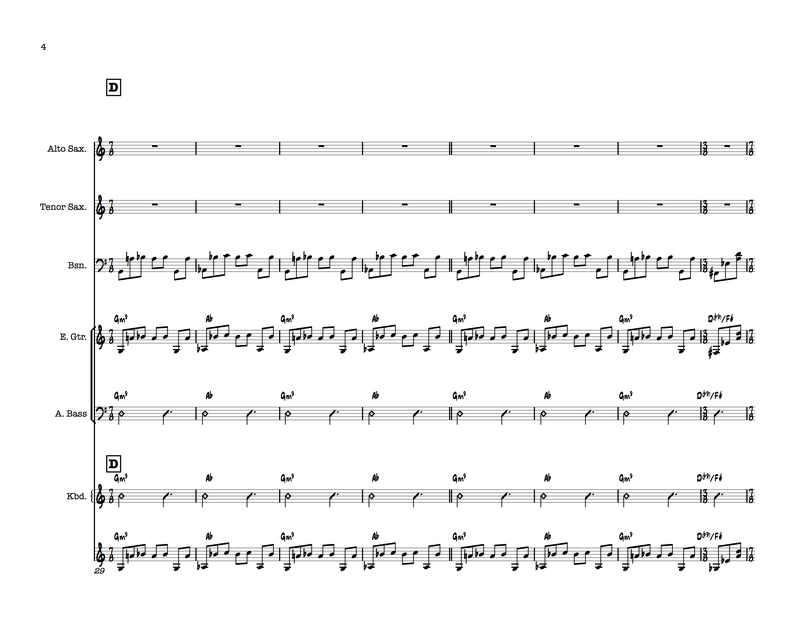 There is then a rhythmic figure repeated four times before moving on to the second motif. This repetitive yet moving figure suggests the unrelated parts coming together momentarily to a section unrelated to the whole. 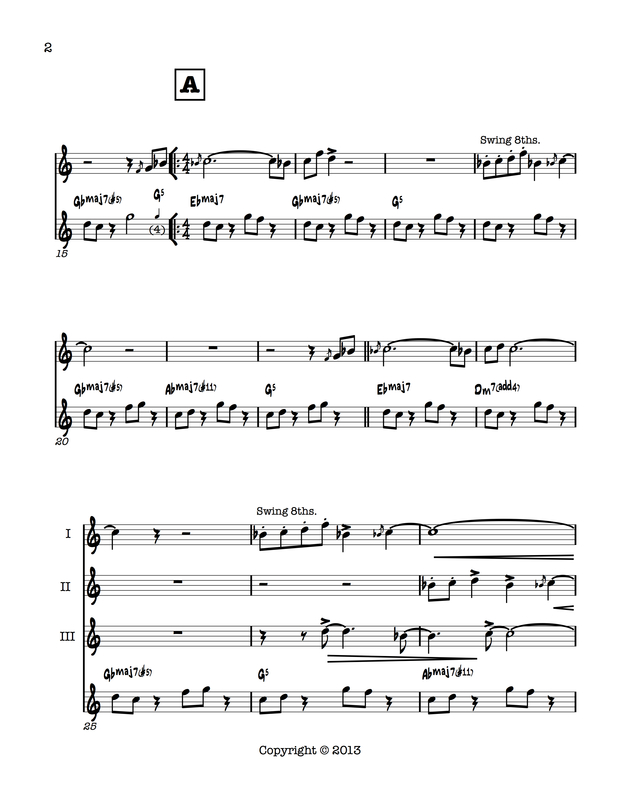 B introduces the second melodic motif in the tenor saxophone along with the first melodic motif and the underlying rhythmic section motif. 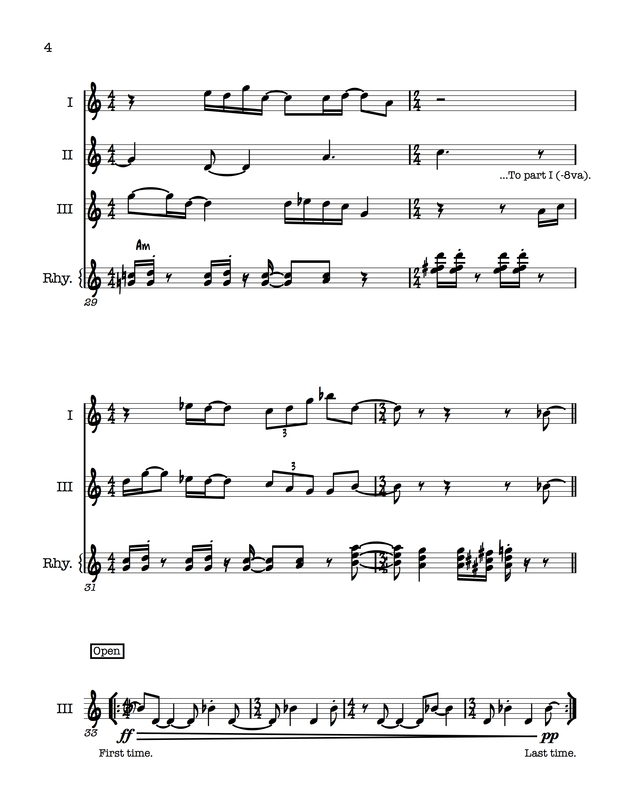 Before moving on to the third motif the soprano, alto, and tenor saxophones improvise over the underlying groove and eventually play with it two times before moving on. At C all three motifs are present on top of the underlying rhythm section motif creating synchronicity. A Red Door to Nowhere expresses longing for events which could have happened while at the same time letting go of this longing. It also conveys a certain retrospective outlook on past events which allows one to disassociate with these memories both positive and negative. 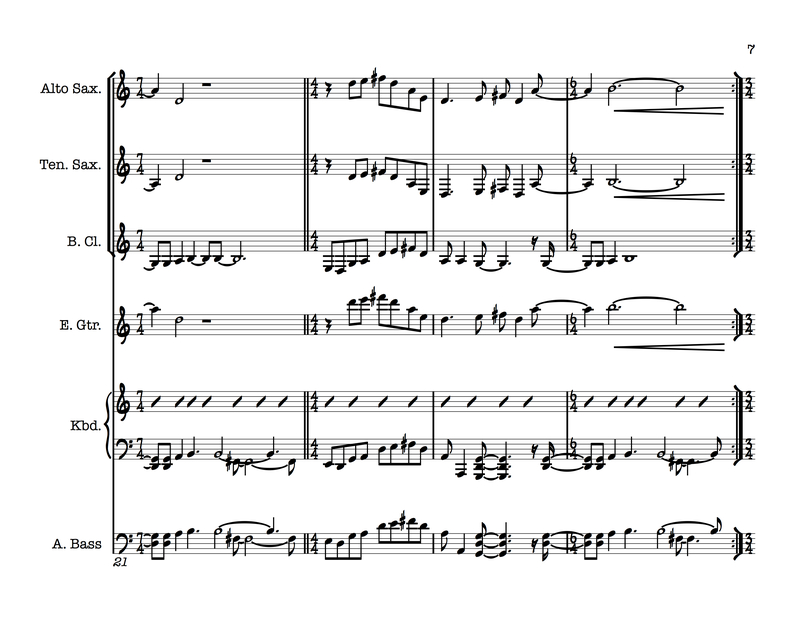 The first statement theme occurs softly with guitar and bassoon at A and is quickly contrasted at B with the guitar playing an angular line in 7/8. 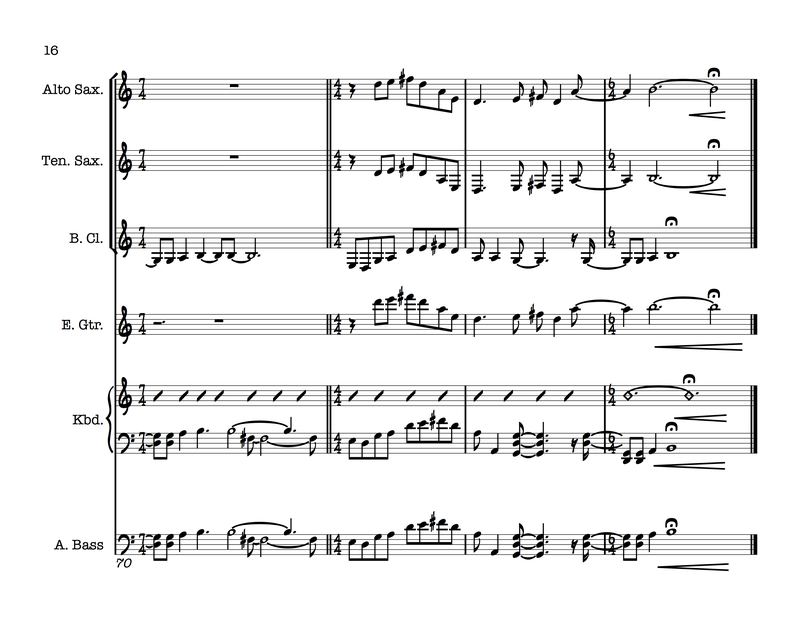 The second statement of this first theme explodes in a strained scream at C. The 7/8 theme of B is twisted at C with the addition of a measure of 3/8 as the fourth measure of a four bar phrase. 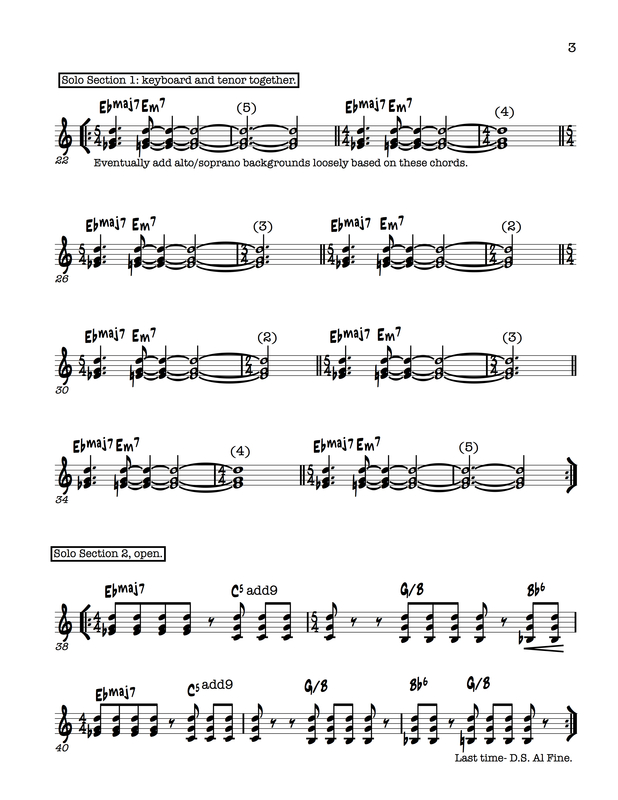 This theme then develops into the first solo Nick Salvucci on tenor saxophone. The screams and tensions of the tenor saxophone are then elevated to double time with a soprano saxophone solo by Spenser Liszt. 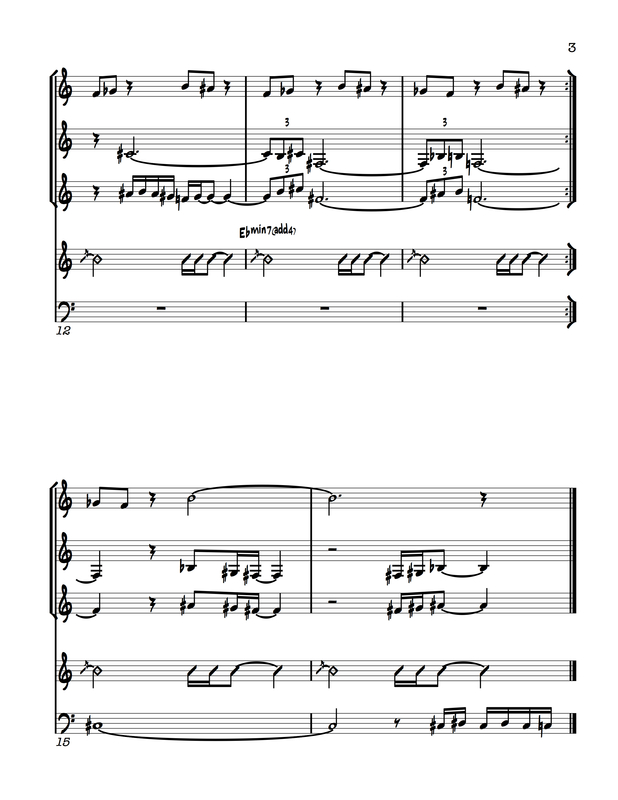 The soprano solo then develops into one final statement of the first theme to suggest that even when letting go of past experiences entirely one will still remember them. 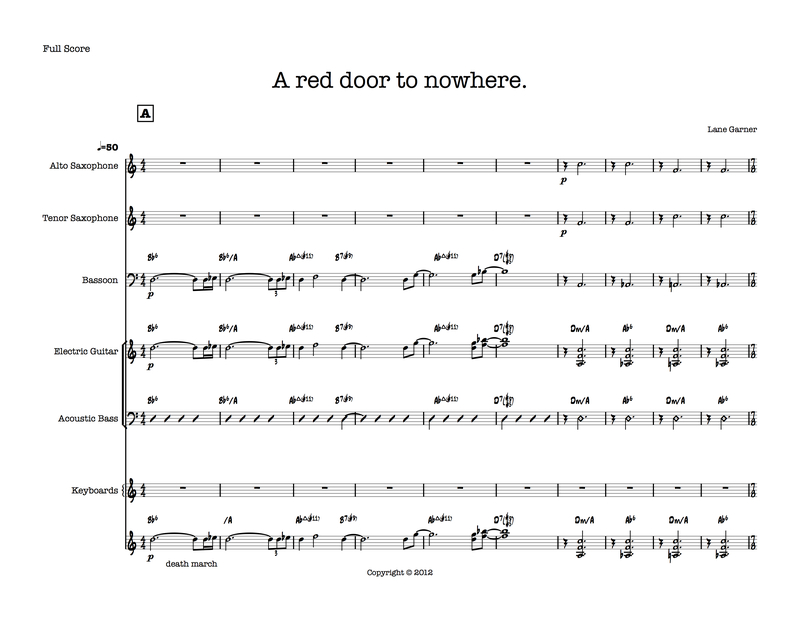 Unknown Road begins with a repetitive rhythmic phrase in the keyboard. The rest of the rhythm section joins in before A. The two notes G and D remain on top of a descending bass line (Eb-D-C-B) creating implied harmonies of Ebmaj7, C5add9, G/B and Bb6. 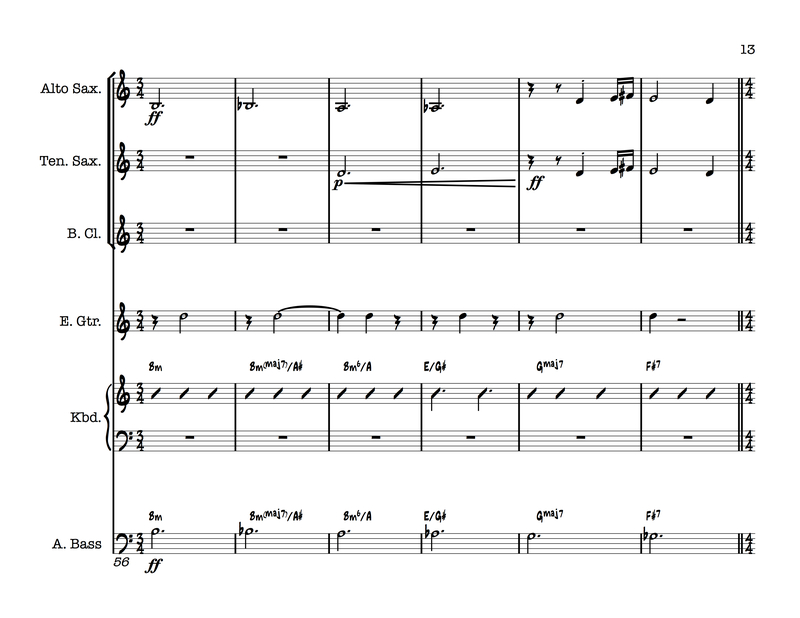 A and C contain a quickly moving unison saxophone melody which is contrasted by an alternate melody at B. These differing melodies over repetitive harmony and rhythm illustrate mental growth and the ability to view a situation from alternate perspectives. The second section is a reference to Killcreek from Development. It begins with a ten-beat phrase that shrinks and grows in an hourglass shape of: ten, nine, eight, seven, seven, eight, nine, ten. 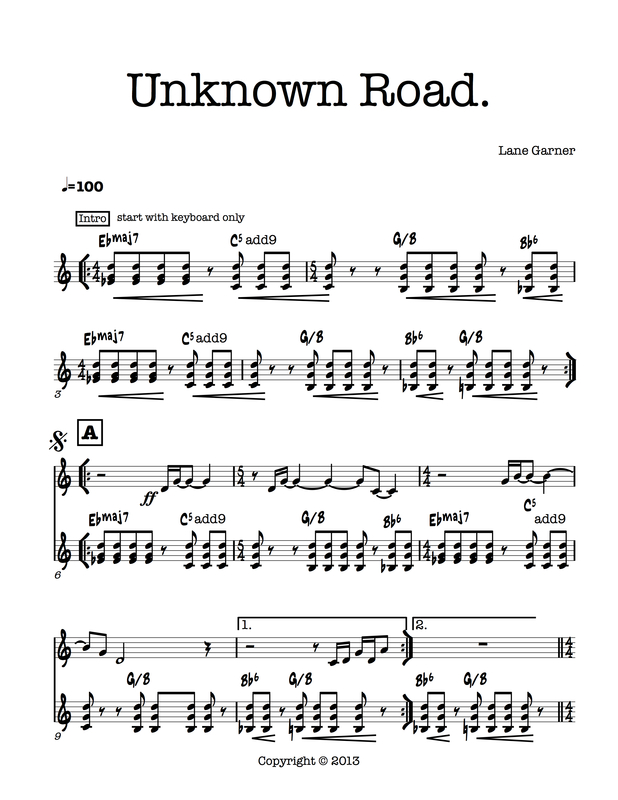 Unknown Road features a duet solo with Addison Frei on keyboard and Nick Salvucci on tenor saxophone and a soprano saxophone solo by Spenser Liszt. 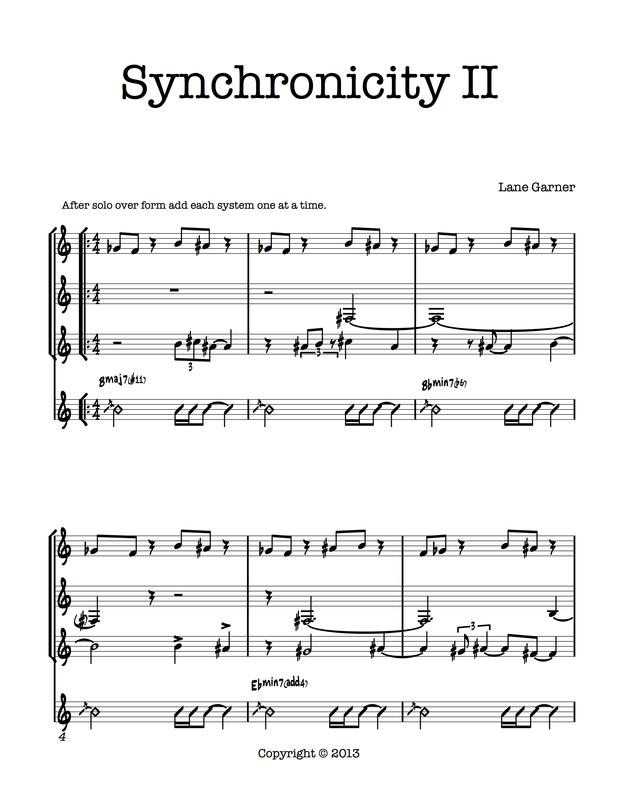 Synchronicity II begins with bass solo by Mike Luzecky over a repetitive figure in the guitar with varying content in the motion of the bass line to create the harmonies. 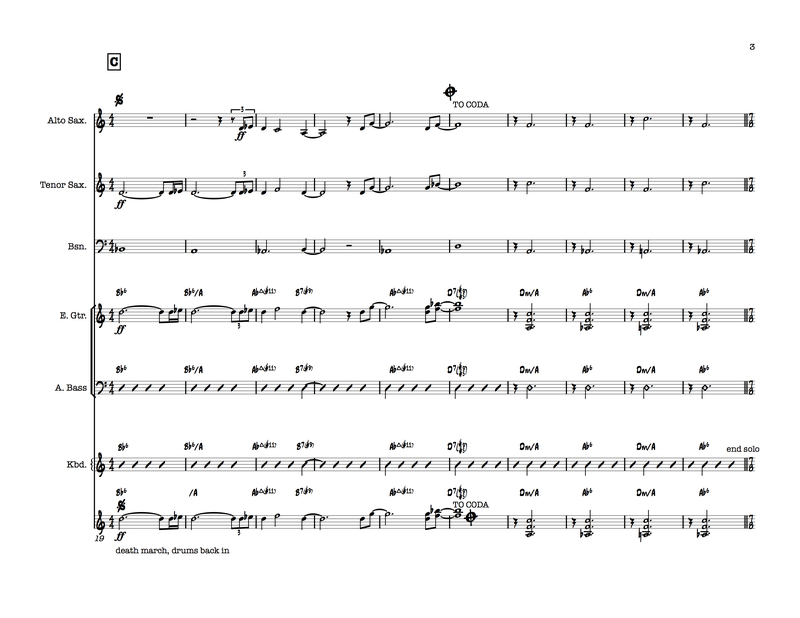 Synchronicity begins with the entrance of the tenor saxophone after that one saxophone is added every thirty-two measures to create melodic synchronicity. 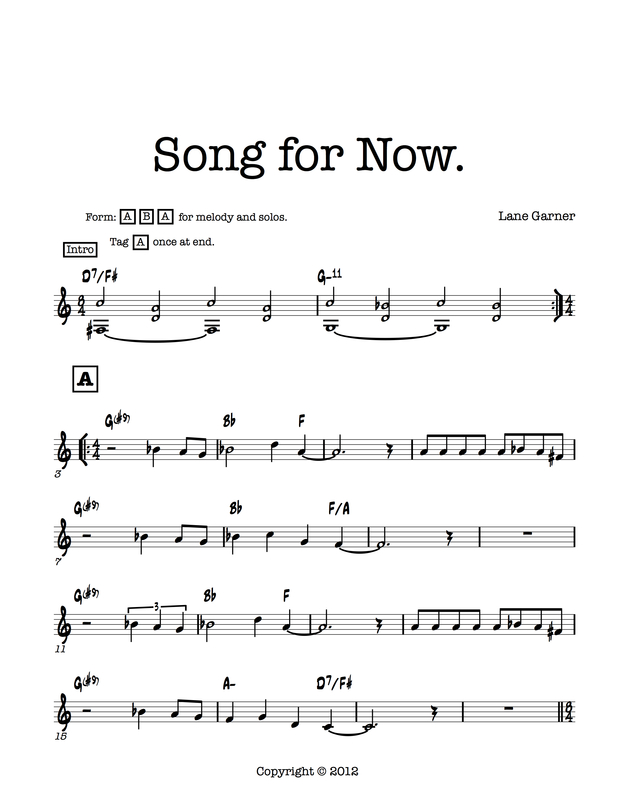 Song for Now was originally composed as the final piece for my masters recital at the University of North Texas in spring of 2012. The title refers to learning to live in the moment- which is the overall enlightenment of the path. 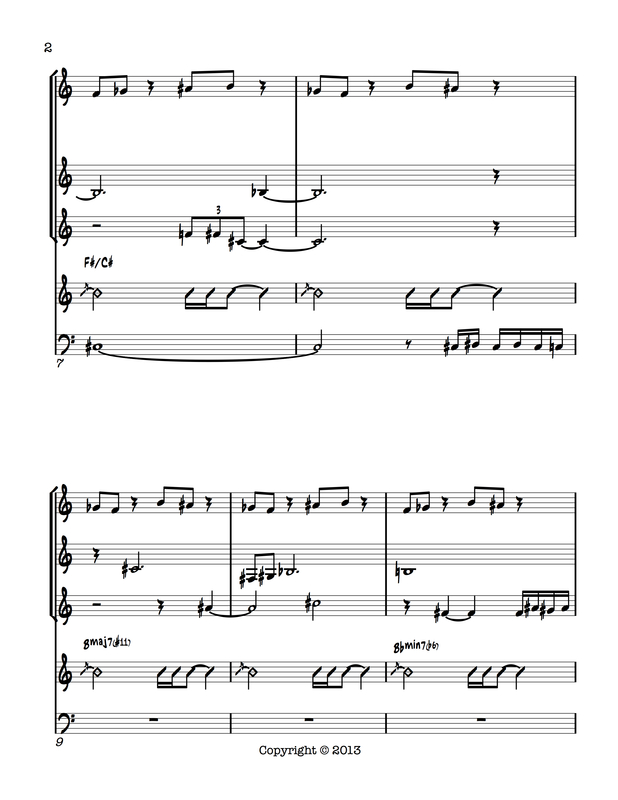 The first section of Song is joyous and enlightened using three major triads- G, Bb, and F. The second section contrasts this joy with one final contemplation through the harmony of D7/F# to G minor. The 4/4 meter of the A section is also skewed in the B section. 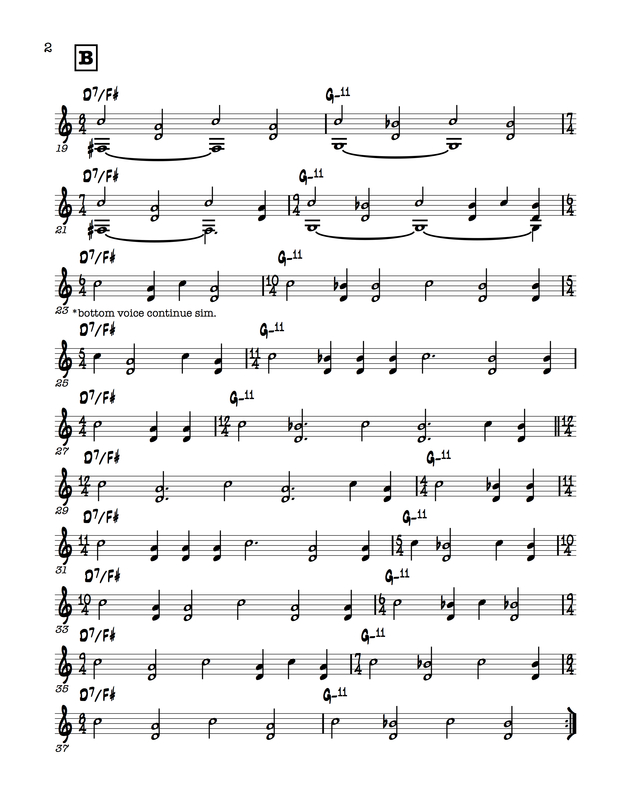 The first four bars are divided 8 beats per chord, then one beat is removed from the first chord and added to the second for 7 beats of D7 and 9 beats of G minor, this happens again- 6 beats and 10 beats, 5 beats and 11 beats, and finally I. The structure then flips and grows back: 12 beats of D7 with 4 beats of G minor, then 11 beats and 5 beats, 10 beats and 6 beats, 9 beats and 7 beats and finally 8 beats and 8 beats. 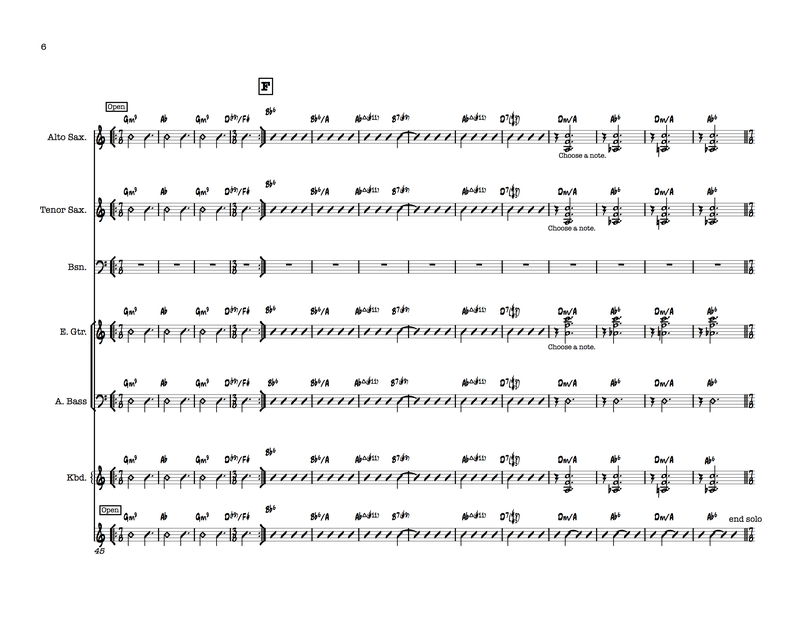 Each soloist works within a miniature awakening, contemplation, enlightenment structure through the B section open (with no metric displacement) bookended by the A section on either side. The soloists on this song are Addison Frei on piano, Devin Eddleman on alto and myself, Lane Garner. on guitar. Each piece on f. stands alone as a composition and story within itself and fits into the greater path of awakening, contemplation, and enlightenment viewed through the scope of a spiritual awakening. This path is paralleled in every facet of life. Through composing, rehearsing, recording, and performing the music on f. we have continued to develop as a group and we look forward to continue doing so in the future.